The graduation rate for Baltimore City students sits at 69.7%, the lowest in the state. * This is more than a statistic, it is individual lives being left behind. In the wake of the Freddie Gray case and subsequent unrest in the city, Baltimore’s young people have sent a clear message: They demand to be part of the conversation on how to improve their lives and bring hope back to Baltimore. 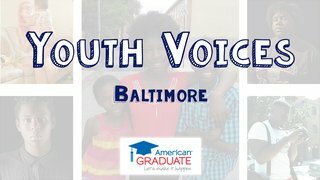 To gain a broader and more complete understanding of the issues at-risk youth face, MPT and project partner Wide Angle Youth Media visited programs in Baltimore City to hear from students themselves. Through short videos, students shared their personal stories, struggles and strategies to overcome obstacles in and out of school. A common thread: the significance of a caring adult in the lives of our city’s youths. On March 2, MPT will present a community conversation to hear from some of the young people who have experienced the difficulties of earning their diploma and discuss how individuals can get involved to help our city’s at-risk youth begin their lives with hope and opportunity. The live discussion, hosted by Karen Gibbs, will be live streamed on March 2 at 4 p.m. at http://americangraduate.mpt.org and broadcast in Spring 2016 as part of MPT’s American Graduate Initiative. Join the live online conversation on Wednesday, March 2, 4 p.m. Check this page before the program starts to watch the live video. Tweet @ThinkportMPT using #AmGradMPT during the program.